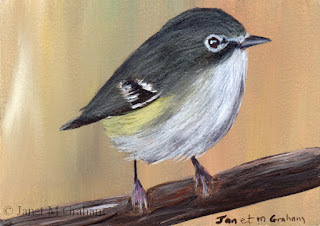 I just love the position this one is perched on the branch and couldn't resist painting him. 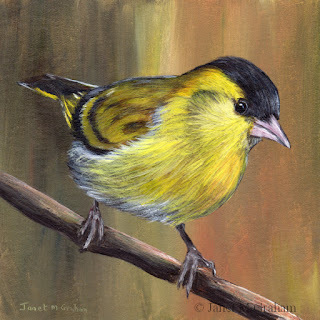 Siskin No 2 measures 5 x 5 inches and is painted on Colourfix Suede paper. 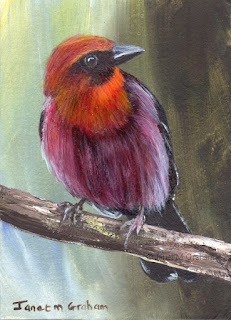 I love the vibrant red feathers of this one. 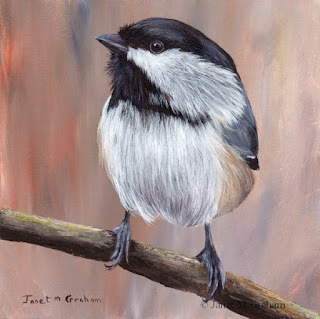 I used quite a few glazes to get the depth to the feathers. Red Warblers are found in the highlands of Mexico. They measure around 12.5 - 13.5 cm in length and weigh between 7.6 - 8.7 grams. Red Warbler measures 3.5 x 2.5 inches and is painted on Colourfix 500gsm Suede paper. Cassin's Vireo is a small North American songbird. They measure between 11 - 14 cm in length and weigh between 13 - 18 grams. Cassin's Vireo measures 3.5 x 2.5 inches and is painted on Colourfix 500gsm Suede paper. Striated Pardalote measures 5 x 5 inches and is painted on Colourfix 500gsm Suede Paper. 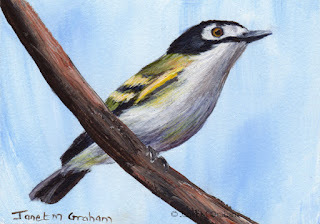 The Black Capped Vireo is a small songbird found in the United States and Mexico. They measure around 11 cm in length and weigh between 8 - 10 grams. 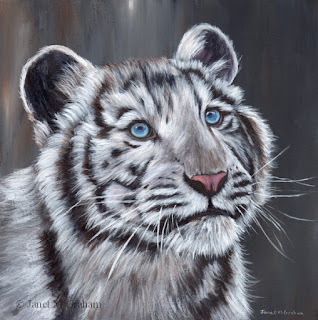 This one was a lot more trickier to paint that I thought it would be. I ended up doing quite a few glazes to get the depth and colour to the feathers. 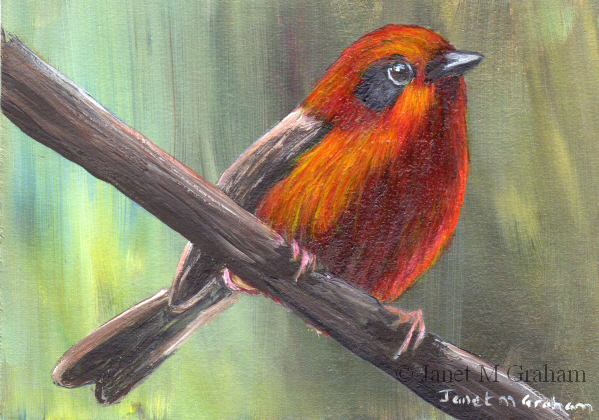 Red Throated Ant Tanager measures 2.5 x 3.5 inches and is painted on Colourfix 500gsm Suede paper. Love the neutral tones of this one. Really pleased with how this one turned out. Common Chiffchaff measures 5 x 5 inches and is painted on Colourfix 500gsm Suede paper. 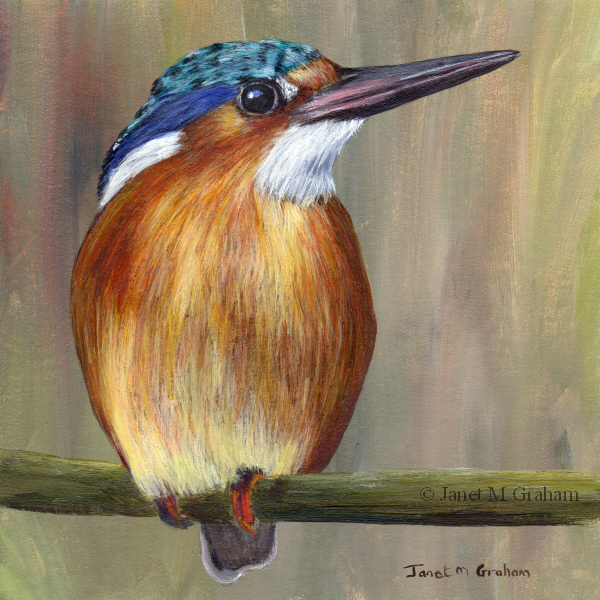 Malachite Kingfisher measures 5 x 5 inches and is painted on Colourfix 500gsm Suede paper. I really love the different position this one is clinging to the branch. Really please with how it turned out. 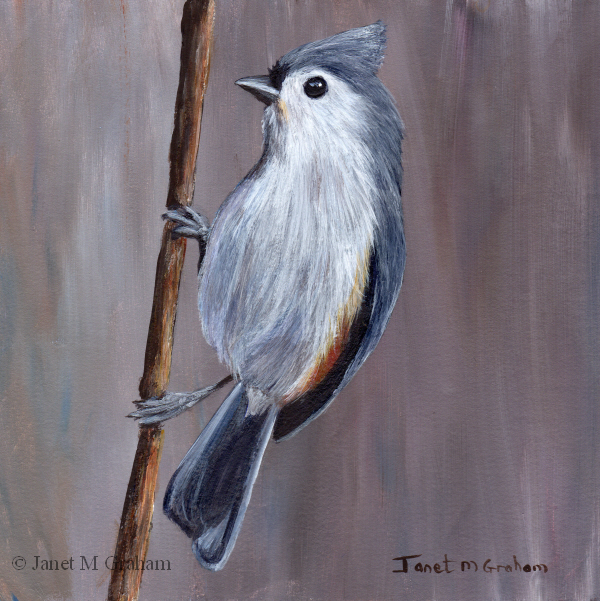 Tufted Titmouse No 7 measures 5 x 5 inches and is painted on Colourfix 500gsm Suede Paper. This one was really fun to paint - love how the feathers are all puffed up. White Throated Swallows are found in southern Africa and measure around 14 - 17 cm in length. White Throated Swallow measures 2.5 x 3.5 inches and is painted on Colourfix 500gsm Suede paper. Love this ones feather colours. 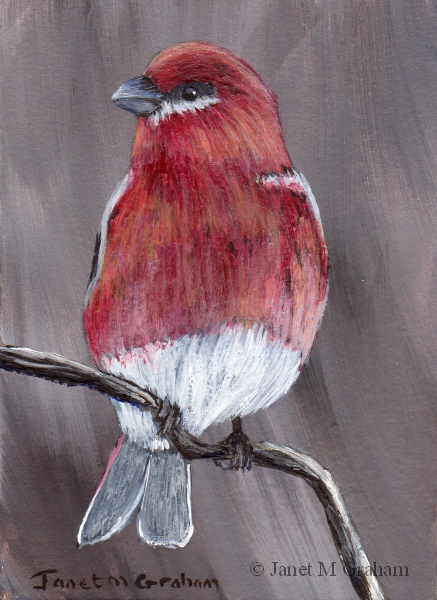 The Pine Grosbeak is one of the largest species of the finch family and are found Alaska, the western mountains of the US, Canada and in subarctic Fennoscandia and Siberia, They measure around 20 - 25.5 cm in length and weigh between 52 - 78 grams. Pine Grosbeak measures 2.5 x 3.5 inches and is painted on Colourfix 500gsm Suede paper. I really enjoyed painting this one - everything just seem work. Scarlet Robin No 2 measures 5 x 5 inches and is painted on Colourfix 500gsm Suede paper. This is my second take on this one. Originally I painted it a few months back on a canvas panel and I didn't like it so I ended up painting over it with gesso and reusing the panel. This time round I decided paint it on the Colourfix Paper and I am really pleased with how it turned out. White Tiger Cub measures 8 x inches and is painted on 500gsm Colourfix Suede paper. 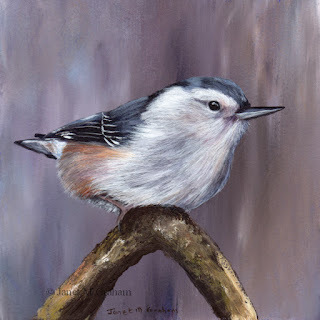 White Breasted Nuthatch measures 5 x 5 inches and is painted on Colourfix 500gsm Suede paper. I love the different position this one is perched. Really please with how it turned out. 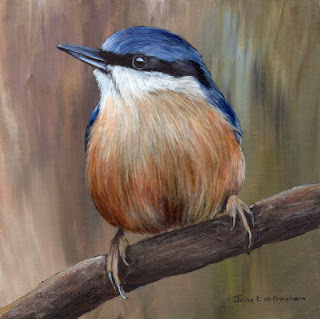 This one is Eurasian Nuthatch. Nuthatch measures 5 x 5 inches and is painted on Colourfix 500gsm Suede paper. 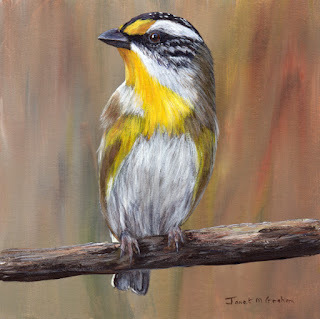 Many thanks to Linda Flynn for the reference photo. 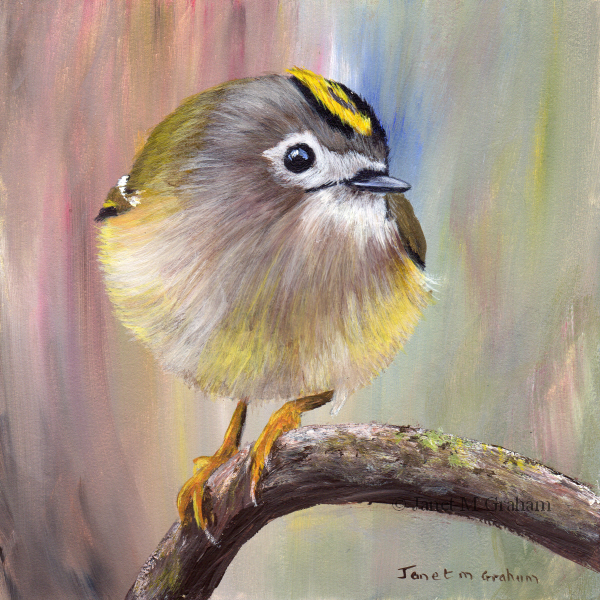 Goldcrest measures 5 x 5 inches and is painted on Colourfix 500gsm Suede paper. Many thanks to Sarah Stribbling for the reference photo. 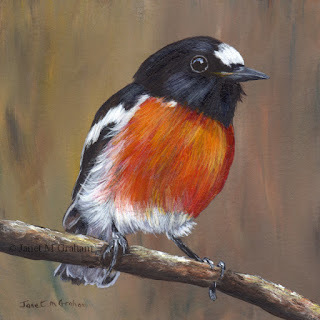 I love painting robins. They always brighten up ones day. 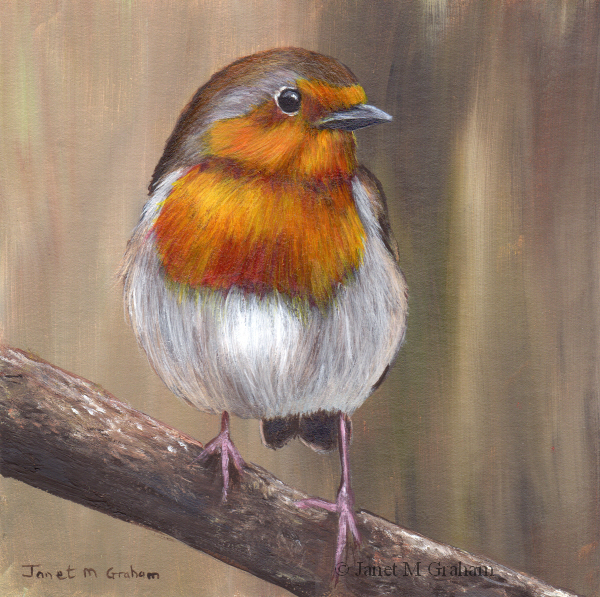 Robin No 11 measures 5 x 5 inches and is painted on Colourfix 500gsm Suede Paper. Black Backed Kingfisher is also known as the Oriental Dwarf Kingfisher or the three toed kingfisher. 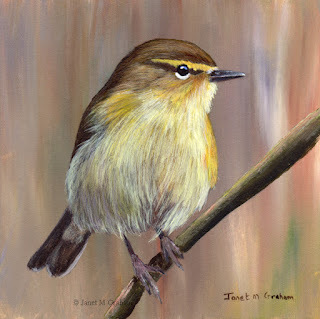 The are found across much of the Indian subcontinent and Southeast Asia. They measure around 13 cm in length. 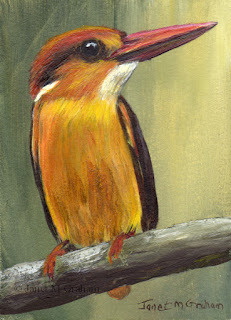 Black Backed Kingfisher measures 2.5 x 3.5 inches and is painted on Colourfix 500gsm Suede Paper. 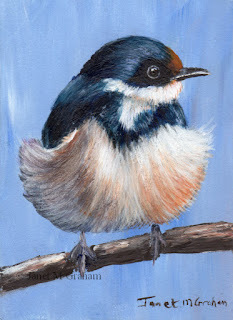 This little one was rather fun to paint - used a few glazes to get the depth to the feathers. The Varied Sittella is also known as the Australian Nuthatch, Black-capped or Orange-winged Sittella or Barkpecker. They are found on mainland Australia. They measure between 10 - 14 cm in length and weigh about 13 grams. 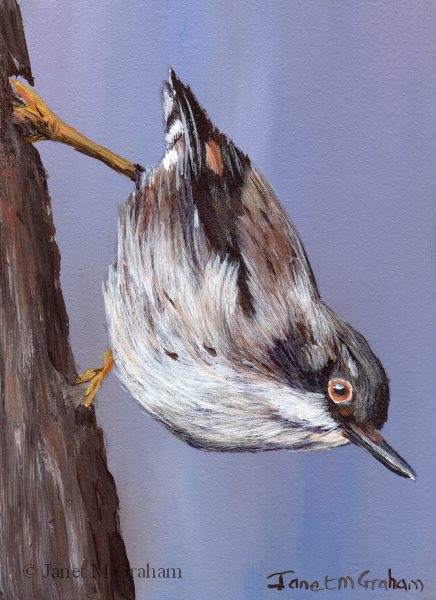 Varied Sittella measures 2.5 x 3.5 inches and is painted on 500gsm Colourfix Suede paper. This one was fun to paint - I love the position it is perched on the branch. Black Capped Chickadee No 3 measures 5 x 5 inches and is painted on 500gsm Colourfix Suede Paper.